I still remember the excitement of finally having my financial support, a residency visa and a plane ticket when I moved to Portugal the first time. The months of waiting for God to show me what I should do and for all of the pieces to come into place to move overseas were finished. In my youth and naivety I assumed the waiting was over. What I learned, rather rapidly, was the waiting had only just begun. Understanding the culture, building new relationships, adjusting to a new role, seeking the next step after my time in Portugal finished – all required more waiting. I’ve never been fond of all of the waiting; I prefer to cross items off my list as quickly as possible and to adjust to a new culture or situation sooner rather than later. Some periods of waiting require working hard and crossing items off lists. If I’d only rested while waiting to leave for the field, I never would have raised the funds to actually leave. Other periods of waiting, however, have involved resting. Surviving a traumatic home invasion while on the field forced me to rest. I was given the gift of a medical leave of absence from my organization and spent the year focusing on healing. While healing in a healthy way demanded I work through mental and emotional struggles, I also rested. My entire being was broken, and although the physical scars were minimal, the emotional and mental ones were deep. Resting meant immersing myself in Scripture and reminding myself of God’s promises, of filling my mind with worship music, of surrounding myself with family and friends. Even now I seek rest when my emotional and mental reserves are low because making time for physical and spiritual rest allows me to have the energy I need for what God is preparing me for. God uses times of waiting in my life to work in my heart. To show me areas of sin I need to confess. To prepare my heart and mind for what He has next for me. Waiting for a new season of life or a new ministry to begin allows God to teach me lessons I desperately need to learn before I enter the next season or ministry. I’ve repeatedly learned to trust in His provision when I wonder where the funds for the next step will come from, to trust in His plan when I’m in the throes of culture shock, and to trust in His goodness when all I see are the difficulties of life. I wait; He works. After years of waiting for marriage, a few months ago I finally became a wife. I can’t tell you the number of tears I cried in my twenties because I desperately longed to be married. Looking back I see how God was preparing me for marriage, how my twenty-one year old self wasn’t ready at all for marriage. Spending my twenties and a bit of my thirties overseas didn’t always seem like good preparation for marriage, but serving cross-culturally has prepared me in a multitude of ways for marriage. And as I adjust to a new role, a new city, a new job, a new church, and new friendships; I’m thankful for all of the work God was doing in my life while I was waiting for marriage. He’s proven over and over again that He is right beside me during major transition and that I will adjust to all of the “new” that surrounds me. Reflecting on the waiting process allows me to truly see all God has done in my life. When the percentage of finances needed is less than five percent, when the first suitcase is packed, when the pilot announces the plane is beginning its descent, when the pictures are hung, when the first conversation in a new language is spoken – we know we are nearing the end of a portion of the waiting process, and our anticipation builds. Each time I boarded a flight to a new country, I was excited for what was ahead. Yes, I learned there would be more waiting, but I also longed expectantly for the moment when my new country would feel familiar. For when I could make it to and from church without getting lost. For when new faces became close friends. For when my role in ministry made an impact on someone’s life. I reveled in those moments because they reminded me the struggle of waiting was worth it. Whether we’re waiting for residency visas to be approved or plane tickets to be purchased or teammates to arrive or culture shock to ease, God is with us. And while waiting still isn’t my favorite aspect of life, I’m learning to embrace the times of resting and working and to smile when I look back and see God’s hand in the process. What have you learned about yourself and about God through waiting? 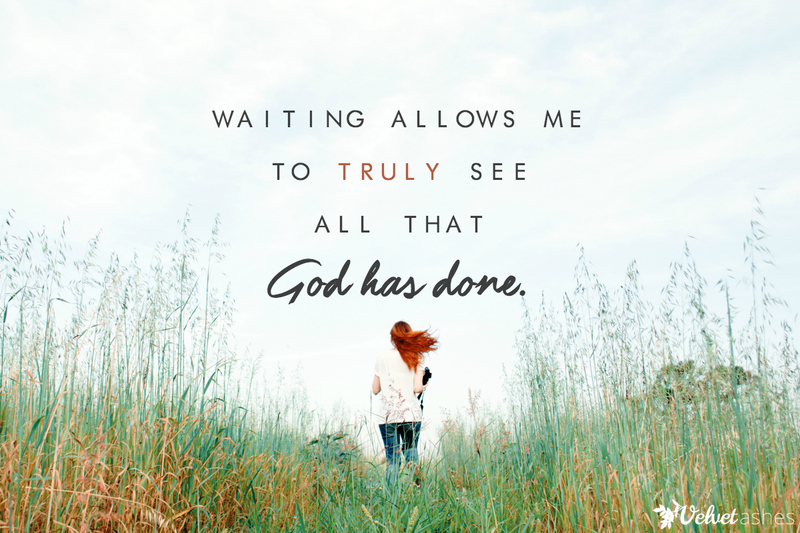 How have you seen God at work in your life as you reflect on periods of waiting? We’re in a season of waiting right now and it is SO hard. And yet some of the deepest and richest lessons from God have come in it. So often I just want the waiting to be over, but I know I’ll look back on this season and be grateful for it. Love hearing how in your season of waiting, God was preparing. It’s been such a joy to watch your journey these past few years. Danielle, praying for you and your family during your time of waiting. Laura, how wonderful to hear your perspective. I too and longing for a husband and don’t see how serving overseas fits into that plan of meeting my future mate. I am glad that your cross-cultural experiences have prepared you for marriage. Thank you for sharing!